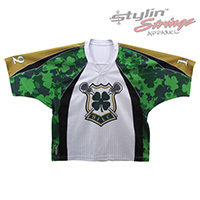 The Shooting Irish lacrosse jerseys were one of the first full custom jerseys we designed in York Pennsylvania. We used a thicker fabric on the shoulders, and a more open big hole mesh in the arm pit area. 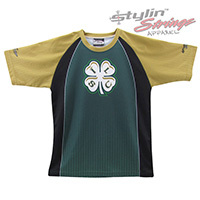 The custom Shamrock logo shield logo on the front was laid on top of a faded out lacrosse stick pattern. The shoulders held the old gold and in between is a custom shamrock pattern in certain main bodylines.